The Jokers, your Liverpool act that play the oblivious and obvious mix of seventies U.K. rock with the hint of fun eighties hard rock. What? Have you heard it all before? They don't look all too well or appealing according to the cover and you're forgiven for thinking about Foreigner's Kelly Hansen while reading the title out loud. It's however their third album of blues fused retro rock with just enough of a contemporary edge to keep it interesting in 2015? As for the retro rock tag, they actually sound like all sorts of so called retro acts from FREE to... well... Y&T. They're good at it too, good enough to have you break dancing in front of their live stage, but perhaps not quite as exciting on record? To be completely honest. The tunes are darn groovy with just enough of hooks to have you sitting around all day in a state of dazed and confused? I'm really on the fence here. 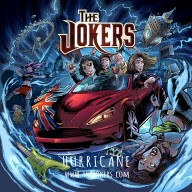 Hurricane is a good album, it's just not exciting enough to have you screaming for more as they go out with the Rockerman, closing track on the album, not counting several bonus tracks taken off previous albums such as Silver City, Radio, Rock N Roll Is Alive, etc. What's up with that? They have a strong reputation and following on the U.K. live scene and Hurricane is vaguely pleasing to these ears.